Product prices and availability are accurate as of 2019-04-24 22:13:49 EDT and are subject to change. Any price and availability information displayed on http://www.amazon.com/ at the time of purchase will apply to the purchase of this product. 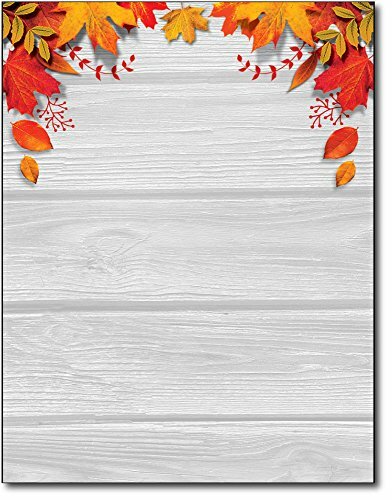 Fall Leaves over Wood Stationery Paper works as a great background for your invitations, letters, flyers, and more. This Fall themed paper features leaves along the top border all over a whitewashed wood background. The Fall Leaves letterhead measures 8 1/2" x 11"and is made from a heavyweight 28lb bond paper stock (105 gsm). Inkjet & laser printer compatible.